We’d love your help. Let us know what’s wrong with this preview of The Design of Everyday Things by Donald A. Norman. Anyone who designs anything to be used by humans -- from physical objects to computer programs to conceptual tools -- must read this book, and it is an equally tremendous read for anyone who has to use anything created by another human. It could forever change how you experience and interact with your physical surroundings, open your eyes to the perversity of bad design an Anyone who designs anything to be used by humans -- from physical objects to computer programs to conceptual tools -- must read this book, and it is an equally tremendous read for anyone who has to use anything created by another human. It could forever change how you experience and interact with your physical surroundings, open your eyes to the perversity of bad design and the desirability of good design, and raise your expectations about how things should be designed. To ask other readers questions about The Design of Everyday Things, please sign up. how to read it on goodreads?I am not getting any option to read. I am reading the new revised-and-expanded-edition. Why it is not showing on Goodreads ? Andrew Eggenberger Tap on “Book Details,” then “Editions.” From there you can switch to the revised and updated edition. After reading this you will never look at any man-made object the same. You will question everything from doors to tea kettles to the most sophisticated computer program. The next time you fumble with an answering machine, web page, or light switch you will think back to the lessons from this book. It is almost liberating once you can see beyond the design of everyday things. I highly recommend this book for anyone. You absolutely must read it if you will ever be in a position to create something After reading this you will never look at any man-made object the same. You will question everything from doors to tea kettles to the most sophisticated computer program. The next time you fumble with an answering machine, web page, or light switch you will think back to the lessons from this book. It is almost liberating once you can see beyond the design of everyday things. For a book that a lot of people rave about as being a 'bible of usability', I have to say it was one of the worst written and designed books I have ever been unfortunate enough to read. Too general to be valuable. Too many sentences like this: "Each discipline has a different perspective of the relative importance of the many factors that make up a product." This took me FOREVER to read - but it isn't the book's fault. It was me just picking it up at odd moments & it giving me a lot to think about each time. I don't design every day things, so had absolutely no need to read this book, but found it extremely interesting. If you have any part in designing anything, you MUST read this book. Norman points out the obvious - things I took for granted - & made me think about them in an entirely new light. He breaks down the simplest devices into t This took me FOREVER to read - but it isn't the book's fault. It was me just picking it up at odd moments & it giving me a lot to think about each time. I don't design every day things, so had absolutely no need to read this book, but found it extremely interesting. If you have any part in designing anything, you MUST read this book. Norman points out the obvious - things I took for granted - & made me think about them in an entirely new light. He breaks down the simplest devices into their basic functions & features, then rebuilds them in a way that is both obvious & yet entirely new. He then points out places where the design elements are good & bad. He gets into the basic aspects of design that I never thought about such as aligning the number of controls with the number of functions. Best of all, he lays all of this out in an interesting manner with common examples as he delves deeper into the problems & solutions. When you walk up to a door, how do you know how to deal with it? I never thought about it, just used it. Norman points out the clues I use, such as where the handles & hinges are located, as well as the conventions, such as pushing to go out of a commercial door, that I just KNOW & intuitively use. But what happens when designers fiddle around to make look pretty? Can anyone screw up something as mundane & venerable as a door? Unfortunately, yes indeedy! He relates a funny story about getting stuck briefly in the foyer of a commercial building because of the 'modern' design of the doors. Hidden hinges, lots of glass, & handles that stretched across the entire center of the door gave no clue as to which way they opened. Couple that with one set of doors opening in the opposite direction from the others & a simple task - walking into a building without much thought (actually while thinking of other things, like the upcoming meeting) - became an irritating puzzle. Not a big deal? Actually, it is. Norman pulls out some truly horrific numbers to make a great point on how important intuitive design is. The average person has something like 30,000 different instruction sets to remember on a regular basis. If each one of these took just a minute to remember, you'd spend several months learning them, assuming a 40 hour week devoted to the task! That we've absorbed these instructions & conventions over decades & are facing an increasing number of them on a daily basis makes it particularly irritating when they get redesigned into a problem. While some of the examples are a bit dated, such as VCR's, they're not terrible. The multifunctional switches, confusing menus, & seemingly random options packed into those machines have carried over into their descendents in spades. Other examples, such as phone systems & stoves, are still so on target that it's absolutely infuriating. OK, phone systems are complicated, extremely proprietary & full of more options than ever, but do they HAVE to be so hard to use? I don't think so. I know damn well that designers could do a much better job of laying out the controls for something as simple as a stove. They've had over a century & it's still a complete PITA to figure out which knob operates which burner. I can't walk up to any stove & put my hand on the correct knob. I have to read, sometimes even puzzle out symbols to figure out which is which. Even on my own simple stove, which we've had 5 years, I wind up reading to figure out the controls. OK, Marg usually cooks, but that's just STUPID design - one more minor irritation in a world filled with them, but one that could so easily be rectified with just a bit of thought!!! It's just infuriating. While I was reading this book, a couple of examples of its relevance slapped me in the face. - Steve Jobs died. Why was he so successful? Many people say that he was an inventor. WRONG. He rarely came up with anything truly new. His forte was in timing & design. Microsoft had a tablet for years before the iPad but their offering never made it. Why? Because the hardware couldn't support the overall expected functionality properly AND the user interface wasn't nearly as well designed as the iPad. Microsoft tried too early, designed it poorly, & FAILED themselves right out of the market. - Amazon took the ebook market by storm. The Kindle wasn't the first ereader & it isn't really all that great hardware-wise, but it has a great interface that leverages a wonderful support system - all good design. It does one thing & does it really well. Jeff Garzik gave me a copy of this back when he was building the Linux network stack in Home Park; I'd seen it praised by a few other people by that time as well (via the GT newsgroups, most likely). I was underwhelmed -- there were a few good case analyses (the oven UI I recall being particularly effective), but very little usable, general principles came out of the read. I went back in 2006, thinking I'd perhaps missed something, but didn't find much more. then again, i'm probably not the targ Jeff Garzik gave me a copy of this back when he was building the Linux network stack in Home Park; I'd seen it praised by a few other people by that time as well (via the GT newsgroups, most likely). I was underwhelmed -- there were a few good case analyses (the oven UI I recall being particularly effective), but very little usable, general principles came out of the read. I went back in 2006, thinking I'd perhaps missed something, but didn't find much more. then again, i'm probably not the target audience. this book seems to receive much play in computer science programs, but it's really much more of an industrial design text; its prevalence in CS programs evidences IMHO the sad state of HCI textbooks. Couldn't get in to it. Maybe I'll try again at a different time. On a side note, I found it odd that a book about user-centered design had line-broken right-justified headings and baffling use of italics. Have you ever stood in front of a door, or a microwave, absolutely flummoxed, because the damned thing gave you no clue whatsoever how to open it. If so (even, I venture to think, if not), you will enjoy this book. In clear, coruscating prose he exposes the miserable flaws in the design of everyday objects which conspire to make our lives less convenient, more miserable, and sometimes more dangerous. The book is not just an exposé of the appalling laziness and hostility to consumers that is commo Have you ever stood in front of a door, or a microwave, absolutely flummoxed, because the damned thing gave you no clue whatsoever how to open it. If so (even, I venture to think, if not), you will enjoy this book. In clear, coruscating prose he exposes the miserable flaws in the design of everyday objects which conspire to make our lives less convenient, more miserable, and sometimes more dangerous. The book is not just an exposé of the appalling laziness and hostility to consumers that is commonplace among designers(not just in the software industry, which is a story unto itself - see "The Lunatics are Running the Asylum") - it is also a clarion call to action. We need not live in a world where it appears that appliances conspire to make us feel like idiots. And when they do - when you can't figure out which button to push, or whether a door opens inward or outward - remember that you are not the one at fault. It is the lazy incompetent designer of the thing which is making you miserable who is deserving of scorn and ridicule. Far too often, in a design world which favors form over function and usability, crimes against the user get rewarded with prizes and the acclaim of the design cognoscenti. People who presumably never have to struggle with the consequences of their own reckless disregard for the usability of the objects they design. The Design of Everyday Things (DOET) is the story of doors, faucets and keyboards; it's the tale of rangetops and refrigerators. Donald Norman beckons the reader to look at the common objects they deal with every day in new and methodical ways. And he offers this central question; what makes an object well-designed as opposed to poorly-designed? But on the question of design DOET, itself an everyday object, rates poorly. Norman's discussion of individual items proves inconsistent and rarely syste The Design of Everyday Things (DOET) is the story of doors, faucets and keyboards; it's the tale of rangetops and refrigerators. Donald Norman beckons the reader to look at the common objects they deal with every day in new and methodical ways. And he offers this central question; what makes an object well-designed as opposed to poorly-designed? Even more fundamentally, explanatory pictures rarely occupy the same page as the text that references them, forcing the reader to page back and forth. That the typesetting for his book is so awkward feels especially glaring as that's the sort of basic design flaw DOET seeks to expose. To Norman's credit, he shows passion for the subject and writes engagingly when he isn't listing psychological vocabulary words. And the subject of design is fascinating; relevant to everyone, applicable to all areas of life and endlessly detailed. And Norman routinely finds interesting digressions; applying design principles to Legos or charting every plausible game of Tic-Tac-Toe. And I found myself agreeing with Norman's core philosophy. He argues that function should supersede features and usability is more important than aesthetics. He also takes the stance that if you can't figure out a gadget, it probably isn't your fault and he goes into detail about how common this sort of confusion is. Norman takes a decidedly pro-humanity outlook in a book all about objects; just one more irony. After all, DOET is a poorly-designed study of design regarding a mundane subject that fascinates. BLUF: A good-to-great primer on human-centered design, albeit one that's lighter on examples and political introspection than I'd hoped for. I'll admit: since first hearing about "Norman doors" in college and then seeing the hilarious "second degree burn kettle" on the cover, I'd built up the idea in my head of this book being some sort of righteous crusade against poorly-designed objects. I looked forward to hours of chuckling along as he gave instances of abominably unusable produc BLUF: A good-to-great primer on human-centered design, albeit one that's lighter on examples and political introspection than I'd hoped for. I'll admit: since first hearing about "Norman doors" in college and then seeing the hilarious "second degree burn kettle" on the cover, I'd built up the idea in my head of this book being some sort of righteous crusade against poorly-designed objects. I looked forward to hours of chuckling along as he gave instances of abominably unusable products, starting from the accidental and working his way towards the truly negligent or coercive, skewering each for our edification; by explaining the shortcomings of each example and walking through the process of improving it (if possible), the reader would come to a bottom-up understanding of the principles of HCD. Fortunately, there are plenty of click-baity listicles to get my design schadenfreude fix, because this is definitely not that book. First of all, Norman is only incidentally concerned with "objects" per se - the first chapter or two uses a fair number of them to ground the ideas of mappings and physical constraints, but the book as a whole is mostly concerned with the more intangible disciplines of user interface and process design. This actual makes for a more mind-expanding book, as the reader discovers the underlying analogy between the building blocks of physical and non-physical forms of design. Secondly, contrary to the polemic I was expecting, Norman's voice is actually pretty neutral and empathetic throughout. Rather than casting blame, he investigates failures of design as a whole the same way he's investigated actual accidents: by seeking root causes in broken feedback loops and failures to account for human nature. Despite a writing style that I'd call bland and curt (I think in the interest of sound neutral and accessible? ), I blew through the first five chapters - solid material with exciting implications! However, DOET started to drag for me in the last two chapters ("Design Thinking" and "Design in the World of Business"), which felt less like popular non-fiction and more like a corporate self-help manual. Maybe it's just a problem of audience? The practical workplace material is probably interesting for current-or-aspiring designers themselves, but IMHO, it has far less to offer the casual reader. Worse, it brought to the foreground some ethical issues that the book had until then steered clear of, but without providing any satisfactory answers for. As far as I can tell, DOET would like its readers to think that its central principles are apolitical: the reader is encouraged to pursue designs that are usable for a wide variety of users based on their size, ability level, and culture, but this is still viewed through the functional lens of creating the most effective products. What does "effective" mean though? I don't want to assume the worst in the author, but the text itself does little to contradict the idea that "effectiveness" is no more and no less than a means towards profitability. Case in point: it wasn't until Norman briefly touched on (and conspicuously failed to condemn) the strategy of planned obsolescence that it occurred to me just how limited in scope his idea of "human"-centered design really is. Wouldn't a design philosophy that holistically factored in human needs and psychology favor durable, recyclable products with replaceable components rather than products we're forced to discard every year or two, polluting our environment for generations? Wouldn't a human-centered design philosophy content itself with products that served actual human needs, rather than preying on our insecurities to create new ones? Are "humans" supposed to be the ultimate beneficiaries of Norman's "human-centered design", or are we just a demographic to be focus-grouped as a means of maximizing market penetration? I got this as an audiobook, based on the fact that it falls within my usual taste for non fiction and because it's been referred to by many other books. In many ways, this is a classic book that inspired many people to think more seriously about design. At least, that's my impression, garnered from the unreasonably long introduction in which the author talks about how great and important his book is. Confession time: I didn't finish the book. I got down to about the last hour and ten minutes and I got this as an audiobook, based on the fact that it falls within my usual taste for non fiction and because it's been referred to by many other books. In many ways, this is a classic book that inspired many people to think more seriously about design. At least, that's my impression, garnered from the unreasonably long introduction in which the author talks about how great and important his book is. Confession time: I didn't finish the book. I got down to about the last hour and ten minutes and finally had enough. This book is boring. I spent most of my time listening to it trying to figure out why it was so boring. I like design. I like sociology. I like pop science. I like non-fiction. Why did this book make me drift off and not know what he'd said for ten to twenty minute chunks? I'm not exactly sure, but I've got some ideas. First of all, the book references illustrations. Yes. In an audiobook. I went to my audible account to delete it, and saw that the pdf of the illustrations had thoughtfully been included in the download. So I looked at the illustrations, but they still weren't that great. They clarified some things that I didn't understand, but they didn't add a tremendous amount to the understanding of the text. If the book had been littered with illustrations, with "here's good" next to "here's bad", it might have helped, but then it wouldn't have been a good audiobook. Secondly, the book had too much abstract descriptions and made-up words.Remember when you were in elementary school and they'd have a textbook that talked about, say, the natural resources of a country, and they'd have vocabulary words in bold that you had to remember for the test? But they were artificial, like "grasslands" meant something different from "savanna" which was different from "prairie" This book kinda did that, at least in the first chapters, like he was structuring this as a textbook to teach you principles of good design. His principles sort of made sense, but they had too few examples to elucidate them, and what anecdotes and examples he included often were completely off-topic. The middle to second half of the book got especially off-topic, degenerating at times into a rant about how hard VCRs are to program and DOS computers are to use. Which brings me to my third point: this book is really dated. In some ways it's cool; he describes a smart phone decades before one existed. In other ways, it's not really relevant. He talks about frustrating faucets, for example, he derides motion-detecting faucets as difficult to use because they aren't obvious. Most people these days use motion-detecting faucets just fine. He talks about how awful computers are, but he's talking about a computer that anyone under the age of 25 has never seen. Even if it weren't for the overly-abstract, poorly described principles he wants people to learn from, the age of his observations makes this book not relevant. Excellent piece of non-fiction. This book is a prescribed textbook for a course on computer interface design that I'm doing. Once I really started reading it, I almost couldn't put it down - it was so interesting that it almost read like fiction - none of the dry dust usually found in conventional textbooks. Very well and humorously presented, and a must for engineers, designers, manufacturers and inventors everywhere! This book, although the examples are dated (as listed in nearly every review), is quite fabulous. The original title was actually "The Psychology of Everyday Things" which was less friendly to the average person, but quite accurate. I think that the younger generations (like myself or maybe this is just applicable no matter the period in history) assume that older people or even people their own age who don't understand technology are dumb. I know I've felt that. While working in a game dev company, we often expressed how stupid our users were, because things seemed obvious to us. It was great to hear his thoughts on how it's not your fault you can't figure something out, it's the designer's. I think anyone who has ever made something needs to hear that. You made it, you have a mental model of how it works, of course it seems intuitive to you. He also goes into the difficulties designers face in getting to a good design and the struggle to keep a good design from being changed along the way. Can't believe I hadn't read this before. There's a lot of wisdom in this book. I'd highly recommend for anyone pursuing a career in design, product, marketing, or tech, or anyone who just wants to build great products. Internalize these ideas and put them into practice and you will create better products that will impact people's lives. This was written in a decade before authors learned how to write stimulating non-fiction. This book came out around 1988 and was updated in 2002. That's not a problem through most of it. there are timeless principles here that will make any designer of consumer goods better at his job. These principles will also help the rest of us to be smarter consumers or just smarter people. I'm a man before I'm a consumer. A...man...I tell you! It's little dry in places and there were points when it occurred to me that this book would really benefit from an update but if you take This was alright. DoeT isn't the world's best written book—Norman's style is too often kvetchy-casual, sounding more like a modern-day ranty blog post than a classic of academic design writing. But that is only one way in which this book is ahead of its time. The observations and recommendations regarding usable design here hold to extremely well 25 years later; even though Norman's examples concern ancient phone systems and slide projectors, it all translates perfectly well to virtual touchscreen UIs of today. A DoeT isn't the world's best written book—Norman's style is too often kvetchy-casual, sounding more like a modern-day ranty blog post than a classic of academic design writing. But that is only one way in which this book is ahead of its time. The observations and recommendations regarding usable design here hold to extremely well 25 years later; even though Norman's examples concern ancient phone systems and slide projectors, it all translates perfectly well to virtual touchscreen UIs of today. And when he makes predictions about the future, he's eerily prescient. Watch him describe smartphones, the World Wide Web, Nest thermostats, and Siri… in 1988. Not only does he correctly predict future technology, he's better aware of its problems than today's designers. Sensible thinking, but does come across at times like an 80s observational comedy routine about motion sensitive taps. I'll be looking up some of his other books to see if he's as good at predicting and suggesting product improvements as he was back then. * are the relevant features visible? is feedback visible? * is it clear what the mapping is from interface to resulting actions? * when user interacts with each control, is there appropriate feedback? * can user identify when he's made an error? can he undo the error? are the 'human errors' ever catastrophic? * are there constraints you can apply to reduce possibility of error? * it also seems that his line of thinking was adopted into the types of user testing that i'm familiar with...let naive users play with the product with no guidance and see what sense they make of it. what mistakes do they make? when were they surprised by how the product behaved? why? A classic for a reason. The examples are dated, but if you still remember rotary dial telephones (maybe over 30 years of age?) you'll be fine with them. Since Norman more or less predicts iPhones and iPads in this book, I'd love to read an update chapter from him in the next edition. The principles are still accurate and useful, and Norman makes a solid case for why my inability to get through doorways safely is actually the fault of the manufacturers. People using products are busy, they have t A classic for a reason. The examples are dated, but if you still remember rotary dial telephones (maybe over 30 years of age?) you'll be fine with them. Since Norman more or less predicts iPhones and iPads in this book, I'd love to read an update chapter from him in the next edition. The principles are still accurate and useful, and Norman makes a solid case for why my inability to get through doorways safely is actually the fault of the manufacturers. People using products are busy, they have their mind on other things, and they can't read the mind of the designer. Therefore, if you're in any way responsible for making a product for other people to use, it's worth your while to take a look at how to embed the knowledge of how to use it within the object itself. I'm just going to be real. This book was incredibly boring. I picked it up because I was told it was a classic of the field and would be useful to have in my reading repertoire. And truthfully, the only reason I gave it two stars instead of one is because of the impact this book has clearly had on the design field. I'm sure at the time of its original release, this book was light years ahead of others in the way that it thought about design. I can definitely see how its concepts have become a ma I'm just going to be real. This book was incredibly boring. I picked it up because I was told it was a classic of the field and would be useful to have in my reading repertoire. And truthfully, the only reason I gave it two stars instead of one is because of the impact this book has clearly had on the design field. I'm sure at the time of its original release, this book was light years ahead of others in the way that it thought about design. I can definitely see how its concepts have become a main part of every design education. But ultimately, I thought this book was too wordy. It said in hundreds of pages what, in my opinion, could probably have been said in less. A lot of it is very common sense, in that most people don't even really think about the concepts. 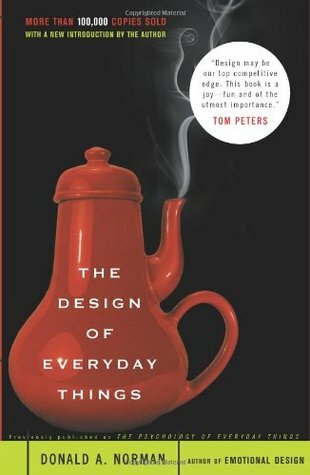 A splendid book that I finally got around to reading, The Design of Everyday Things walks us through exactly what the title promises. Norman explores phones, doors, car keys, VCRs, water faucets, and signage, looking for principles that show how these work well or poorly. Despite the author being a psychologist, the books is beautifully bereft of jargon. It reads like Asimov's nonfiction: accessible, brisk, pedagogically attuned, and often witty. One nice assumption: that the user (you) is usually A splendid book that I finally got around to reading, The Design of Everyday Things walks us through exactly what the title promises. Norman explores phones, doors, car keys, VCRs, water faucets, and signage, looking for principles that show how these work well or poorly. One nice assumption: that the user (you) is usually right. When we run into problems with things, it's often because of poor design. As someone who grows more obsessed with bad signage every year, I found this a very pleasant read. Una volta sfrondato dalla reiterazione sfiancante alla È facile smettere di fumare se sai come farlo il messaggio profetico emerge in tutta la sua evidenza. Non siamo noi ad essere cerebrolesi, ma è il progettista ad essere diversamente scadente. Detto questo, mi accingo a progettare una ciotola a sezioni basculanti con timer incorporato e pulsanti a idrogetto per il mio cane, in modo che anch’esso (si noti il lieve sadismo in crescendo che culmina in un anch’esso da tenore), si convinca di quanto bello è, il caro e vecchio design della ciotola rossa/acqua, ciotola blu/ cibo. The main question in my mind after listening to this audiobook is easily enough answered: How old IS this book, anyhow? In the introduction the author talks about how the book isn't dated. Well, it was originally published in 1988. One of the pieces of technology most discussed is the videocassette recorder. The VCR. The computers being discussed are about a step beyond the ones that were capable of adding three numbers together using a bank of systems that would fill a room. Some of the book is The main question in my mind after listening to this audiobook is easily enough answered: How old IS this book, anyhow? In the introduction the author talks about how the book isn't dated. Well, it was originally published in 1988. One of the pieces of technology most discussed is the videocassette recorder. The VCR. The computers being discussed are about a step beyond the ones that were capable of adding three numbers together using a bank of systems that would fill a room. Some of the book is relevant no matter what, as the prologue or forward or introduction or whatever it was points out. But not all of it is. Much of the point of this book is: "When people have trouble with something, it's not their fault. It's the fault of the design." And I don't buy it. Maybe it's because I have less faith in humanity than the author does, but – well, I've seen it (including, to be honest, in myself). I did not like the book Wizard's First Rule, but something I love and use all the time is its explication of Wizard's First Rule: "People Are Idiots". Yes, it should be obvious whether a door needs to be pushed or pulled to get the thing open – but in most if not all of the cases I've seen it's not actively hidden. In my experience, people just don't pay attention. People don't read. Example: I can't tell you how many emails I've sent, only to have to reiterate some or all of it almost immediately. I used to run an international online-based Secret Santa, and every year after the emails went out I braced myself for the slew of responses asking questions that were answered in the initial email. Because people don't read. I've learned that when I ask two questions or provide two pieces of information in an email, the second one is going to go completely unnoticed. More than two? Forget it. Now, I've long ago learned that my tendency to wordiness won't fly in business emails – I've learned to pare it down. Still, people don't read. Recent example: in reply to a question from one of my bosses, I wrote "I’ve attached [three pieces of documentation for a delivery]; it looks like there was no delivery ticket created." That was the first line of my email. One of them replied with "Do we have delivery ticket?" I sat and stared at it for a couple of minutes, thinking of and discarding possible responses, and then just wrote back "There was no delivery ticket, as far as I can see". I just don't understand. Example: I can't tell you how many people go up to the fax machine in the office and ask whether paperwork has to be face-up or face-down. (The owner of the company asks every time.) (Every. Time.) How do you work in offices as long as these people have without learning that there is a little graphic on the machine to answer just that important question. (I also can't tell you how many blank faxes I've received over the years, because people a) didn't read and b) didn't ask, and just faxed away. Upside down.) The design is just fine: the question is answered. I'm not sure how else it could be addressed; bright colors or flashing lights? Or big letters? Nah. It's fine. People are idiots. So your car radio is difficult to use while driving? Here's a thought: Don't use it while driving. You might want to watch the road instead. The author talks about an expensive hoity toity Italian washing machine that was so badly designed the owners were afraid to touch it. "Why did they buy it?" the author asks. Well, because it's an expensive hoity toity Italian machine – and they're stupid. They wanted conspicuous consumption, or got snowed by a salesman who perceived their weakness. Plus they probably hire someone to do their laundry anyway, or at any rate seem to be able to afford to. And the author complains about the problems inherent in lowering a projection screen in a lecture hall – but it sounds like the hall long predates slide projectors. The projector had to be installed in the place long after the fact, and in such a way (I would assume) so as not to do any mischief to the structure or artistry of the room. So – yeah, it's not perfect. It doesn't exist in perfect conditions. Work with it. Or hold your lectures somewhere else. And the author complains about senseless instructions for those VCR's, and all I could think was, well, they're often translated, badly, from Japanese. Now, I do agree with the basic premise of the book. Of course an object should be designed so that it's not difficult to use. But … well, see, over the sink in my apartment there are three switches. When I had a tour of the place I was told that the one on the left controlled the light, the one in the middle controlled the garbage disposal, and the last one was for the dishwasher. When I moved in a little while later it took about five minutes' trial and error to work it out again. Now I don't have to think about it. I don't need a huge sign on the wall. Figure it out yourself: you'll probably remember it longer. "Control/alt/delete" isn't an intuitive command for the computer – but the reason for that is pretty sensible: it's not something that can be done using one or two close-set keys … because it's not something you want to do accidentally. And once it's learned, it's easy enough to remember. Okay, go back to the whole door thing. The author admits that he has problems with doors. And I get it – if there's no label on a door it can be hard to know whether you're supposed to push or pull or whatever. But – at least nowadays – I think every door I see in a public venue has a little sign. Or - know what? If you're meant to pull, there's probably a handle, and if you're meant to push there's probably a bar. And … I'm sorry, I can't muster up a whole lot of sympathy for the person who pulls on a door that says "push", or vice versa – including me. Honestly, I have little patience with anyone (including me) who doesn't read the damn directions. I also don't have a lot of patience for someone, like the man in this book, who goes out and buys a massively expensive Italian washing machine without making sure he understands how to use it. Yes, that can be blamed on the design; it can also be blamed on the salesman seeing dollar signs, and on the fact that any instruction manual is probably translated from the Italian – and on a level of carelessness and lack of preparedness by the buyer. I'm sorry – if you don't put in a certain level of research into a big purchase, you deserve what you end up with. If I need, for example, to make a spreadsheet do something I don't know how to do, I don't write a letter to MicroSoft complaining about the poor design of Excel. I figure it out, or I look it up. If I don't know what a word means, I look it up. You know the adage that God helps those who help themselves? I like it. I work with people who don't bother to try to solve any problem for themselves. If they don't know how to do something, they sit in their seats and yell like children for help – literally. It sounds like the author is in favor of this attitude – everything should be obvious, and if it's not you're entitled to squawk. It's learned helplessness. My feeling on this is basically that if I can figure it out, or look it up, anyone can – and damn well should. And read my damned email, jackass. This a required read for anyone who wants to design things for humans to use, but it was more like a textbook than I hoped when I picked it up. Lots of design vocabulary and lots of fairly common-sense principles. Don Norman is definitely one of the early design thinkers and this is where he talks about it all. Signifiers and feedback are key in designing something. The user needs to be able to quickly understand what it can do (affordances) and get immediate and appropriate feedb This a required read for anyone who wants to design things for humans to use, but it was more like a textbook than I hoped when I picked it up. Lots of design vocabulary and lots of fairly common-sense principles. Don Norman is definitely one of the early design thinkers and this is where he talks about it all. Signifiers and feedback are key in designing something. The user needs to be able to quickly understand what it can do (affordances) and get immediate and appropriate feedback when they do something. Human Centered Design Process: all about observing to understand the problem, ideating solutions, rapid prototyping and testing. You should test with small groups at first so that you have lots of opportunity to refine and iterate. I especially liked the part about using the Wizard of Oz technique: manually handling the backend yourself and letting the user think you are automating it. I think that's often the best way to test whether something will gain traction. Doesn't work for everything, but sometimes it's very useful. This book is amazing. You'll never look at another door or faucet in the sameway. If you take anything from this book, it is these 7 principles of making a difficult design task an easy one. 1. Use both knowledge in the world and knowledge in the head. 2. Simplify the structure of tasks. 3. Make things visible: bridge the gulfs of Execution and Evaluation. 4. Get the mappings right. 5. Exploit the power of constraints, both natural and artificial. 7. When all else fails, standardize This book is amazing. You'll never look at another door or faucet in the sameway. 7. When all else fails, standardize. The book introduces basic psychological concepts from areas such as cognitive psychology and ties them into usability and design. Even though the book feels a bit outdated (they talk about rotary phones and old sewing machines), all the principles covered in the book still apply today. Even though the book was written with things in mind that most of us won't necessarily use anymore (such as the problem of threading a projector), the principles are still useful to know when designing modern-day th The book introduces basic psychological concepts from areas such as cognitive psychology and ties them into usability and design. Even though the book was written with things in mind that most of us won't necessarily use anymore (such as the problem of threading a projector), the principles are still useful to know when designing modern-day things from cell phones to websites. * Even if you aren't professional designer, you still use design everywhere in your life, including how you design your house, your resume, a report, some code, etc. * Design is all about focusing on people's needs and abilities. You may think you know what those are by the virtue of being a human, but you don't, as most human actions are unconscious. Therefore, to be a good designer, you need to learn some psychology. * Good design is all about finding the root cause (not just the stated problem) and using an iterative process (there are no failures, just experiments). * Many of the things we attribute to human error are actually caused by poor design. This is because humans make mistakes _all the time_ and a good design _must_ take this into account. For these alone, it's worth reading. That said, the book feels a little unfocused and scatter brained. It frequently goes off on tangents, most of which are interesting, but not always relevant to the main points. The book is also repetitive, repeating the same message about bad design, constraints, and culture over and over again. Good design is actually a lot harder to notice than poor design, in part because good designs fit our needs so well that the design is invisible, serving us without drawing attention to itself. Bad design, on the other hand, screams out its inadequacies, making itself very noticeable. We are all designers in the sense that all of us deliberately design our lives, our rooms, and the way we do things. We can also design workarounds, ways of overcoming the flaws of existing devices. All artificial things are designed. Whether it is the layout of furniture in a room, the paths through a garden or forest, or the intricacies of an electronic device, some person or group of people had to decide upon the layout, operation, and mechanisms. Not all designed things involve physical structures. Services, lectures, rules and procedures, and the organizational structures of businesses and governments do not have physical mechanisms, but their rules of operation have to be designed, sometimes informally, sometimes precisely recorded and specified. Human-centered design is a design philosophy. It means starting with a good understanding of people and the needs that the design is intended to meet. This understanding comes about primarily through observation, for people themselves are often unaware of their true needs, even unaware of the difficulties they are encountering. Getting the specification of the thing to be defined is one of the most difficult parts of the design, so much so that the HCD principle is to avoid specifying the problem as long as possible but instead to iterate upon repeated approximations. This is done through rapid tests of ideas, and after each test modifying the approach and the problem definition. The results can be products that truly meet the needs of people. A conceptual model is an explanation, usually highly simplified, of how something works. It doesn’t have to be complete or even accurate as long as it is useful. When people use something, they face two gulfs: the Gulf of Execution, where they try to figure out how it operates, and the Gulf of Evaluation, where they try to figure out what happened [...] The role of the designer is to help people bridge the two gulfs. We bridge the Gulf of Execution through the use of signifiers, constraints, mappings, and a conceptual model. We bridge the Gulf of Evaluation through the use of feedback and a conceptual model. Most of us start by believing we already understand both human behavior and the human mind. After all, we are all human: we have all lived with ourselves all of our lives, and we like to think we understand ourselves. But the truth is, we don’t. Most of human behavior is a result of subconscious processes. We are unaware of them. When we speak, we often do not know what we are about to say until our conscious mind (the reflective part of the mind) hears ourselves uttering the words. When we perform a well-learned action, all we have to do is think of the goal and the behavioral level handles all the details: the conscious mind has little or no awareness beyond creating the desire to act. We need to remove the word failure from our vocabulary, replacing it instead with learning experience. To fail is to learn: we learn more from our failures than from our successes. With success, sure, we are pleased, but we often have no idea why we succeeded. With failure, it is often possible to figure out why, to ensure that it will never happen again. Scientists know this. Scientists do experiments to learn how the world works. Sometimes their experiments work as expected, but often they don’t. Are these failures? No, they are learning experiences. Many of the most important scientific discoveries have come from these so-called failures. Eliminate all error messages from electronic or computer systems. Instead, provide help and guidance. Humans err continually; it is an intrinsic part of our nature. System design should take this into account. Eliminate the term human error. Instead, talk about communication and interaction: what we call an error is usually bad communication or interaction. When people collaborate with one another, the word error is never used to characterize another person’s utterance. That’s because each person is trying to understand and respond to the other, and when something is not understood or seems inappropriate, it is questioned, clarified, and the collaboration continues. Why can’t the interaction between a person and a machine be thought of as collaboration? Our strengths are in our flexibility and creativity, in coming up with solutions to novel problems. We are creative and imaginative, not mechanical and precise. Machines require precision and accuracy; people don’t. And we are particularly bad at providing precise and accurate inputs. So why are we always required to do so? Why do we put the requirements of machines above those of people? 1. Discoverability. It is possible to determine what actions are possible and the current state of the device. 2. Feedback.There is full and continuous information about the results of actions and the current state of the product or service. After an action has been executed, it is easy to determine the new state. 3. Conceptual model. The design projects all the information needed to create a good conceptual model of the system, leading to understanding and a feeling of control. The conceptual model enhances both discoverability and evaluation of results. 4. Affordances. The proper affordances exist to make the desired actions possible. 5. Signifiers.Effective use of signifiers ensures discoverability and that the feedback is well communicated and intelligible. 6. Mappings. The relationship between controls and their actions follows the principles of good mapping, enhanced as much as possible through spatial layout and temporal contiguity. 7. Constraints. Providing physical, logical, semantic, and cultural constraints guides actions and eases interpretation. Never criticize unless you have a better alternative. When people err, change the system so that type of error will be reduced or eliminated. When complete elimination is not possible, redesign to reduce the impact. When many people all have the same problem, shouldn’t another cause be found? If the system lets you make the error, it is badly designed. And if the system induces you to make the error, then it is really badly designed. When I turn on the wrong stove burner, it is not due to my lack of knowledge: it is due to poor mapping between controls and burners. Teaching me the relationship will not stop the error from recurring: redesigning the stove will. Why do people err? Because the designs focus upon the requirements of the system and the machines, and not upon the requirements of people. Most machines require precise commands and guidance, forcing people to enter numerical information perfectly. But people aren’t very good at great precision. We frequently make errors when asked to type or write sequences of numbers or letters. This is well known: so why are machines still being designed that require such great precision, where pressing the wrong key can lead to horrendous results? In many industries, the rules are written more with a goal toward legal compliance than with an understanding of the work requirements. As a result, if workers followed the rules, they couldn’t get their jobs done. Good designers never start by trying to solve the problem given to them: they start by trying to understand what the real issues are. Don Norman's Law of Product Development: The day a product development process starts, it is behind schedule and above budget. Good designers are quick learners, for today they might be asked to design a camera; tomorrow, to design a transportation system or a company’s organizational structure. How can one person work across so many different domains? Because the fundamental principles of designing for people are the same across all domains. People are the same, and so the design principles are the same. A couple of weeks ago a colleague brought some tarts to the office from Art Café. The lemon tarts were white and the coconut ones were yellow. You could see the grimaces on everybody's faces as they bit into what they thought was lemon pie and got a mouthful of coconut instead. Donald Arthur Norman is a professor emeritus of cognitive science at the University of California, San Diego and a Professor of Computer Science at Northwestern University, where he also co-directs the dual degree MBA + Engineering degree program between the Kellogg school and Northwestern Engineering. Norman is on numerous company advisory boards, including the editorial board of Encyclopædia Bri Donald Arthur Norman is a professor emeritus of cognitive science at the University of California, San Diego and a Professor of Computer Science at Northwestern University, where he also co-directs the dual degree MBA + Engineering degree program between the Kellogg school and Northwestern Engineering. Norman is on numerous company advisory boards, including the editorial board of Encyclopædia Britannica. He currently splits his time between consulting, teaching, and writing. He co-founded the Nielsen Norman Group, a consulting group on matters of usability, which also includes Jakob Nielsen and Bruce "Tog" Tognazzini. 3. Make things visible: bridge gulfs between Execution and Evaluation. 5. Exploit the power of constraints.